SFHEA; BA/LLB (Monash); Masters in Law (Melbourne); RSA Cert (Oxon); Grad Dip.Education (ACU) Doctorate in Juridical Science (La Trobe), RSA (Oxford) Member, Australiasian Society of Evaluators, Member, Vic Restorative Justice Assoc. Melbourne based, Liz’s research focuses on access to justice; effective legal practice; domestic human rights of people in disadvantage; building legal and advocacy capacity of community; impact and effectiveness of service delivery. She has published research reports (2007, 2011, 2012, 2013 and 2015) on outcomes, quality and effectiveness and on a ‘Strategic Approaches to Problem Solving’ (March 2013). 2014- 2019 Liz is commissioned to conduct research evaluations of Health Justice Partnerships (HJP). She evaluated a family violence prevention program in May 2015 which informed the Royal Commission into Family Violence. Liz is a regular media commentator, has participated in government and statutory advisory bodies.Liz is cited in the Productivity Commission Inquiry into Access to Justice and the Allen Review of legal services. Her recent research aims to better reach clients in most need of legal help, who currently have no access, through multi-disciplinary practice. Liz’s research on effective legal and community service practice, impact and positive client outcomes examining what improves the social determinants of health has led to considerable interest domestically and overseas. Liz is advising the Legal Services Board Victoria (LSB) on evaluation to support and guide eight LSB funded services. Her research uses empirical study to find what works and why and gives a voice to people who are often invisible. Appointed February 2017 as 'expert adviser' to the Law Council of Australia's 'Justice Project'. The Law Council of Australia is undertaking a comprehensive national review into the impediments to justice in Australia, focussing on those facing significant social and economic disadvantage in community. The work will culminate in a Final Report at the end of November 2017 following a literature review and consultation process. Adaptive Leadership Training program for the Federation of Community Legal Centres to assist them in the recruitment and retention and fostering of leadership skills in lawyers in community legal centres which service people experiencing disadvantage in the community. Immediate past Co-Convener and member (until end 2017) Federation of Community Legal Centre’s (Victoria) Human Rights Working Group. ANU College of Law's Law Reform and Social Justice Advisory. ‘Multi-disciplinary Practice Health Justice Partnerships–Working ethically to ensure reach to the most in need’, 26 Nottingham Law Journal (2017) 11 -36. ‘Reflections on Practice and Recent Research to Enable Future Practitioners to Learn About Working Collaboratively Across Disciplines to Better Help the Community’ Vol. 12, No. 1, Autumn 2017, Journal of Commonwealth Law and legal Education, 46-64. ‘Reflecting on community development practice: Working with communities for effective change by enabling access to justice’ with P Taylor Barnett and A Vernon, 19 (1) Flinders Law Journal, (July, 2017). 'Measuring Legal Services: A Practical methodology for measuring quality and outcomes of legal assistance services' Vol 32, 1 University of Tasmania Law Review, (2013) 70-95. ‘Integrating Two Measures of Quality Practice into Clinical and Practical Legal Education Assessment: Good client interviewing and effective community legal education’, International Journal of Clinical Legal Education 21(1) 2014 with Tony Foley. ‘Legal Review: Not all in the Statistics’ Law Institute Journal, July 2013, 36 – 39. ‘Delivery of Advice to Vulnerable and Marginalised Groups: The Need for Innovative Approaches’ (with Alexy Buck, Legal Services Research Centre, London), Public Space, The Journal of Law and Social Justice, 2009, Vol 3 (0n-line Journal http://epress.lib.uts.edu.au/journals/index.php(publicspace/article/view/1232/1239. ‘Access to Justice: A new approach using human rights standards’ (with M Noone) International Journal of the Legal Profession, 2008, Vol 15 (3) pp 195-229. ‘Human Rights: making them relevant to the vulnerable and marginalised in Australia,’ June 2008, Vol 33 (2), Alternative Law Journal, pp 70 -75. ‘Relieving Some of the Legal Burdens on Clients: legal Aid services working alongside Psychologists and other health and social service professionals’, Australian Community Psychologist, August 2008, Vol 20 (1), pp 47-56. ‘The Challenge of Defining Legal Need’, Journal of Law and Social Policy, 2007, Vol 21 Spring, Ontario Canada, pp63 -89. ‘Pushing the boundaries or preserving the status quo? Designing Clinical Programs to Teach Law Students a Deep Understanding of Ethical Practice’, (with J Dickson & M Noone) International Journal of Clinical Legal Education, UK, December 2005, pp 104-122. A Research and Evaluation Report for the Bendigo Health–Justice Partnership: A Partnership between Loddon Campaspe Community Legal Centre and Bendigo Community Health Services (October 31, 2016). Available at SSRN: https://ssrn.com/abstract=3076407 published 22 November 2017 by ARC Justice Bendigo Ltd. See also http://lcclc.org.au/wp-content/uploads/2017/11/Abridged-HJP-Final-Resear... abridged report. Final Evaluation Report on the ‘Why Didn’t You Ask?’ – Project of the Family Violence Project of Loddon Campaspe Community Legal Community Legal Centre, ANU, May 2015. ’Solving Legal Problems: A strategic approach’, March, 2013. ANU Law researcher Liz Curran is creating opportunities for lawyers to work in medical clinics to help patients with health problems that are linked to their legal issues. Liz Curran writes the lead letter in The Age on yet another review by the Victorian government into the youth justice system. Lawyers, health workers and counsellors are collaborating to improve access to the law for disadvantaged communities, according to an ANU research paper. This Seminar & Conversation will explore recent public inquiries in Australia and Dr Liz Curran’s research over the past six years suggesting a less adversarial approach may be necessary. 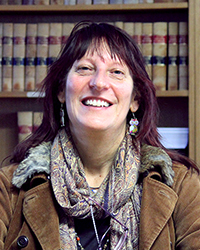 Melbourne based, Dr Liz Curran’s research focusses on access to justice; the rule of law; effective legal practice, domestic human rights of people in disadvantage; building legal and advocacy capacity of community; impact and effectiveness of service delivery. She has published research reports (2007, 2011, 2012, 2013 and 2015) on outcomes, quality and effectiveness and on a ‘Strategic Approaches to Problem Solving’ (March 2013). Between 2014 and 2017 Liz is commissioned to conduct research evaluations of Health Justice Partnerships (HJP). She evaluated a family violence prevention program in May 2015 which informed the Royal Commission into Family Violence. Liz is a regular media commentator and has participated in government and statutory advisory bodies. Her recent research on HJP’s aims to better reach clients in most need of legal help, who currently have no access, through multi-disciplinary practice. Liz’s research on effective legal and community service practice, impact and positive client outcomes examining what improves the social determinants of health has led to considerable interest domestically and overseas. Liz is advising the Legal Services Board Victoria (LSB) on evaluation to support and guide eight LSB funded services. Her research uses empirical study to find what works and why and gives a voice to people who are often invisible. Practice can inform theory and education and vice versa. Ethical and Legal Professional awareness leads to better lawyers in training and good legal practioners. Raising students awareness of how the law works in reality and how it impacts upon people and society and the role they play as legal practitionersin ensuring the intergrity of the legal system and its administration. a number of the interstate intensive ‘Becoming a Practitioner’ (BAP) courses most recently in late December 2016 (Tasmania) January and July 2017 (Melbourne). ‘Giving Voice to Values’, Advanced Skills and Portfolio in the Graduate Diploma in Legal Practice (GDLP) capstone subject, ‘Ready for Practice’ x 6 annualy. She has been involved in course and curriculum design which have incorporated her empirical research that examines what makes a good and effective practitioner. Law Reform leads to better and informed policy. The real impact of the law on human beings can be seen through legal practice and used to inform better policy. Research can also deliver empirical information about how the system works in practice and what works well and why and what does not work so well and why. Recent research on the effectiveness and quality legal services and what works well with youth offenders to prevent the cycle of crime are examples. This work can be used to provide a voice for those who otherwise would not have one and to make an array of well targetted submissions to Parliament and Statutory and Regulatory bodies. The Final Report of the Government Review of the Human Rights Charter in Victoria (September 2015 -17 Times).